It was with great sadness that we saw the passing on 9th January 2015 of yet another of our Teddy Boy's and Rock 'n' Roll Performers and also a great Compere - Eric 'Rockin Ricky' Nugent, a legend and a personal friend of mine and so many others. Nidge with Eric 'Rockin Ricky' Nugent at the Midland Re-union at the Muldeth Hotel, South Manchester in 2011. I first got to know Eric after I had started to attend the 2i's Reunions in London during the mid 2000's and we became good friends. Rockin Ricky came from Ashton-under-Lyne near Manchester and died on Friday, 9th January 2015. After leaving National Service in the Army during the 1950's, he found a job serving Coffee at the 2i's Coffee Bar in London and personally knew many of the British Rock 'n' Roll Greats. Later in the Seventies he formed the band Rockin' Ricky and the Velvet Collars. In 1976 Eric's band got into the Guinness Book of Records for playing Rock 'n' Roll for 144 hours non-stop - no mean feat! In 1977 Rockin Ricky recorded two songs which became successful for him in Europe in 1978, they were "Someone, Someone" and "Shiela". The Velvet Collars split up in 1982 and Rockin Ricky formed another band called "Ricky and the Rebounds" and this band toured all over Europe. In later years Ricky became the compere at the annual 2i's Re-union hosted by Keith Woods at the Borderline Club in Soho. He recorded a CD in 2014 entitled "Rockin Ricky Reminiscing" and has appeared on numerous radio shows such as the Mike Zodiac Rock'n'Roll Show . Eric was such a amicable bloke and you couldn't ask for a better friend - he will be so sadly missed. Eric was 74 and had been suffering from liver cancer. The funeral was held on Wednesday 21 January 2015, at 9.30 am at Dukinfield Crematorium, Hall Green Road, Dukinfield, Cheshire SK16 4EP - JCN 23 M60 (Manchester Outer Ring Road). 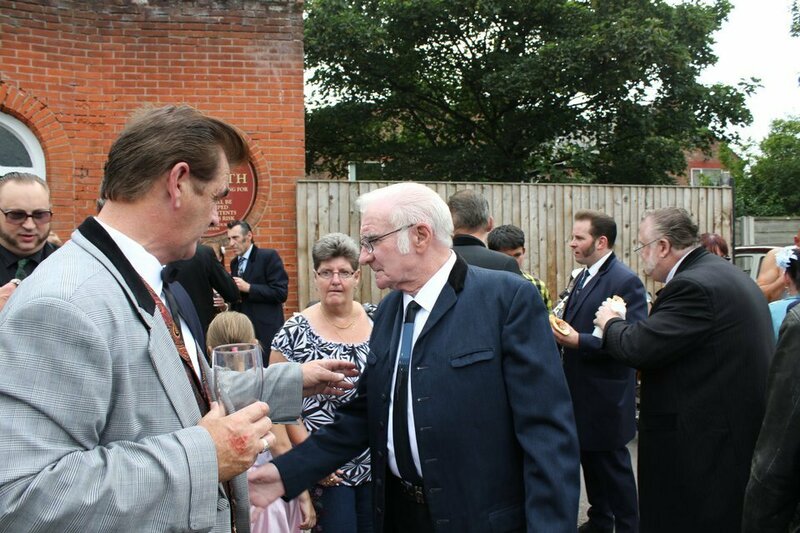 The Wake was held afterwards at the nearby West End Working Men's Club, Grosvenor Street, Denton, Lancashire M34 3WN - JCN 24 M60 (Manchester Outer Ring Road). 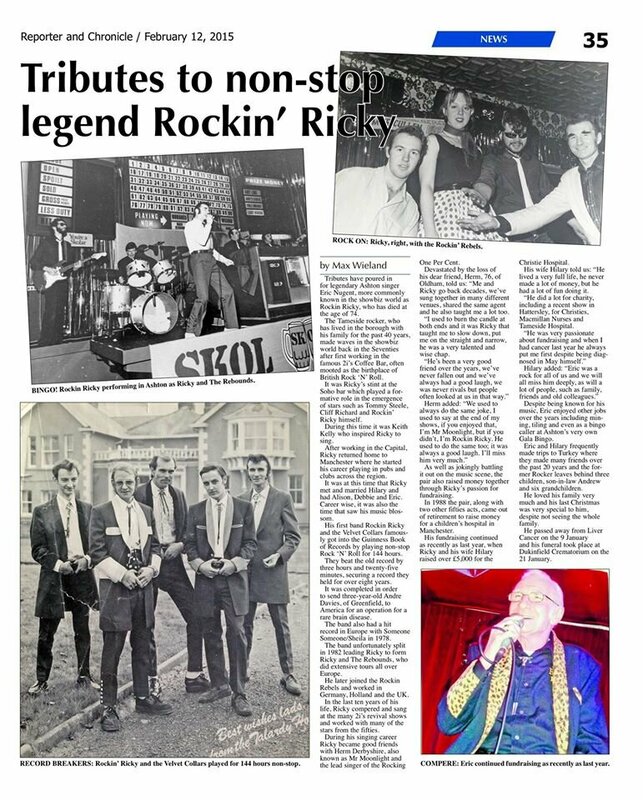 Below an article published in February 2015 in the Tameside Reporter & Glossop Chronice makes a fitting tribute to the life of Eric "Rockin'; Ricky" Nugent. A Tribute by Colin Paul with Rockin' Ricky singing "Angela Jones", a favorite he often performed at venues. The song was originally recorded and performed by Michael Cox in 1960 and was one of the legendary Joe Meek's Productions. Here are some live performances of Eric "Rockin Ricky" Nugent in his Royal Blue Drape with his band The Rebounds undertaken in 1981 at the Lantern Club in Newton Heath, Manchester.